I started playing tennis my sophomore year. I joined because I wanted to look forward to a great senior year and I want to take as many opportunities as I can while I am in high school. I don’t want to look back at my high school years with regrets. What does Nywong bring this team? Nywong is driven and brings leadership and motivation to the team. This year he would like to bring the team to state by being motivated and competitive. Our greatest challenge is being honest with each other after matches on what we could do to improve. Our greatest strengths, though, are our abilities to cooperate and play competitively and aggressively for spots on varsity. Last year, we did not do so well in conference. This year I expect us to do wonderfully! I am hoping that we make it all the way to State! Our greatest competitors this year are Roosevelt, Southwest, and South. Mr. Paek is really motivated. He is very charismatic and brings out the best in us. What's next for Nywong Vang? 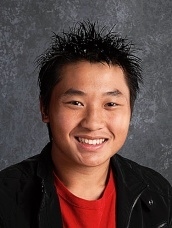 Nywong is planning to attend the University of Minnesota- Twin Cities for Information Technology. While he’s there he would like to continue to play tennis and come back to Henry to see where the team is at.